It is evident from speaking to thousands of residents in the Bromsgrove constituency that it is a two horse race for the parliamentary seat between the Conservatives and the Liberal Democrats. It is not a safe Conservative seat. The Liberal Democrats have a strong candidate who listens and answers voters questions honestly. UKIP will take core Conservative votes away. 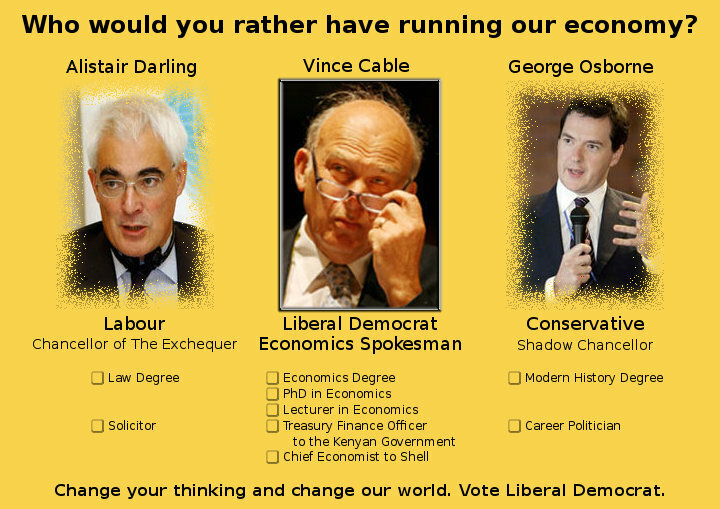 If you want a change for a fairer, better Bromsgrove and Britain then vote Liberal Democrat on 6th May. Fantastic performance by Nick Clegg in the Prime Minister Debate on Thursday night. It’s filtering through in the polls and activity on my website. I’ve been saying for months that it’s wide open in Bromsgrove as people are tired of the other two parties and like what the Liberal Democrats say and behave. Over 60% of people I’ve canvassed are undecided and even they have admitted it is unusual, at first I thought it was the expenses scandal and the way the Conservatives have parachuted an investment banker into the area. That is only part of the reason, the main one is they have no idea what the Conservatives are offering. There will be increased scrutiny of our policies, but we’re expecting that, in fact we’re already ahead of the game and have published detailed figures of our tax plans in our manifesto. Neither the Conservatives or Labour have put a single figure in theirs. It’s been a relatively clean fight in Bromsgrove, lets hope it remains that way. Nothing worse than mudslinging to put the electorate off. I’ll be at the Hanbury Turn on Sunday 11 April 3-6pm to answer any questions you may have, or just a chance to get to know me. There’ll be tea and cakes provided so do pop along if you get a chance. The pub is on Hanbury Road, just outside Bromsgrove.